Budget Dumpster was selected as an award recipient at the 2018 Smart Culture Conference & Awards, presented by Alliance Solutions Group and Smart Business. The Smart Culture Conference & Awards Program recognizes organizations that have developed a culture that bolsters productivity, enhances job satisfaction and provides a competitive advantage in the marketplace. The conference also explores how culture can become an asset to drive employee performance, transform organizations into employers-of-choice and ultimately impact the bottom line. The 2018 event spotlights leading companies in Northeast Ohio where culture plays a crucial role in a company’s success. Fellow honorees include Cleveland Clinic, Hyland Software and the Rock & Roll Hall of Fame. 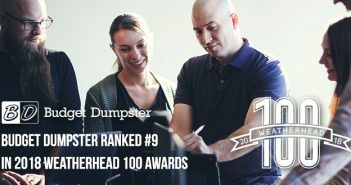 Budget Dumpster was recognized for fostering a culture that emphasizes the values of kindness, innovation and leadership, creating a fun and engaging office environment. Founders Mark Campbell and John Fenn consider employees family, encouraging their professional growth and communicating to them the importance of work-life balance. “We’re very proud of the culture and family we have grown at Budget Dumpster. As we continue to grow, we continue to improve our culture by providing additional resources and opportunities for our staff,” said John Fenn, co-founder and CEO of Budget Dumpster. The culture fostered by Budget Dumpster employees and leaders has led to a low turnover rate and has kept seven of the first 10 employees for more than nine years. Budget Dumpster has also been named a Top Workplace in Northeast Ohio by the Plain Dealer in 2015, 2016 and 2017. To learn more about Budget Dumpster’s office culture and career opportunities available, visit budgetdumpster.com. 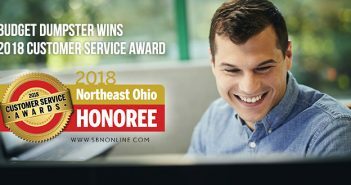 View the full list of 2018 honorees. 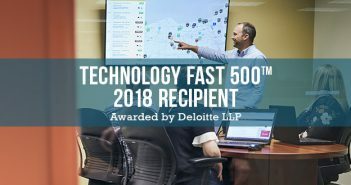 Based in suburban Cleveland with a growing team of over 100 employees, Budget Dumpster has been recognized as one of America’s fastest growing companies by the Inc. 500 (2016, 2017), one of the top five fastest growing companies in Northeast Ohio by Crain’s (2015, 2016), one of the largest waste and recycling firms in North America (No. 67 in 2016) and one of Fortune’s Most Flexible Workplaces (2016). Learn more about how we help people and companies each day at www.budgetdumpster.com.